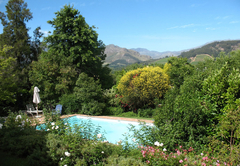 The Garden House is a highly recommended Franschhoek Bed & Breakfast providing accommodation in 2 guest rooms for tourists visiting the Cape Winelands region. 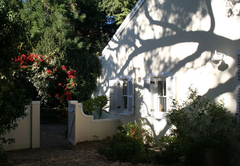 Annette and Barry would like to welcome you as their guests at the Garden House in the pretty and historic village of Franschhoek which is just 80km from Cape Town and and 45 minutes from Cape Town International Airport. 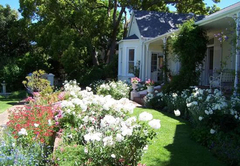 The Garden House, built in Cape Victorian style in 1881, is listed as a building of historic interest. In 1910 it was known as Bellevue and used as a guest house by Mr and Mrs C van Hoogstraten who promised 'cleanliness and unobtrusive attention'. The Cottage is separated from the main house by a shaded courtyard so we all have our privacy. It has a spacious bedroom with warm and cool air conditioning, a ceiling fan, fridge with complimentary soft drinks and beers, radio, TV and DVD player with a selection of interesting films, tea and coffee making facilities, hair dryer and safe. 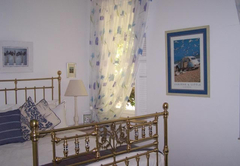 In the large en suite bathroom there is a bath, separate shower and under floor heating. 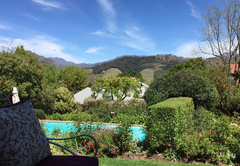 A healthy breakfast with home made mueseli, berries in season and Franschhoek smoked salmon trout is served on the stoep (veranda) with wonderful views across the valley to the Groot Drakenstein and Franschhoek mountains. You can then take our bikes to explore the village with its shops, galleries and restaurants, visit the Huguenot Memorial, the Museum, play golf, go horse riding, hiking, fishing, wine tasting or just relax by our pool. Our guests are welcome to join us for a leisurely sundowner on the stoep before dinner in one of Franschhoek’s fine restaurants most of which are within an easy ten minute walk. 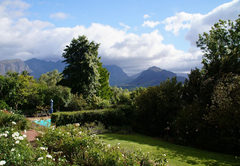 Franschhoek was settled by French Huguenot refugees in the 17th century. 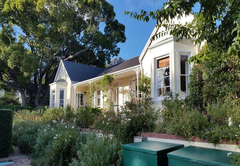 It keeps the French connection with many excellent restaurants (some are regularly in South Africa's Eat Out national or regional Top Ten), wine estates, art galleries and an annual celebration of Bastille Day. A home from home. The accommodation was first class ,The breakfast was fit for a king and we were made to feel like one of the family. Annetts local knowledge was invaluable in seeking out the best places to visit and sampling the local cuisine.We stayed for four nights but wish it had been longer. We will definitely be back. Child policyChildren up to the age of 2 are welcome. 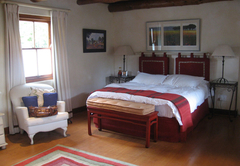 Exceptions to check-in / out times by arrangement, please enquire.